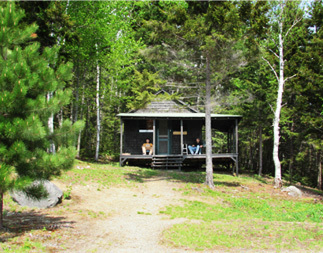 Bulldog Camps is located in a remote wilderness area in the western part of the state surrounded by Maine's beautiful mountains and woods. 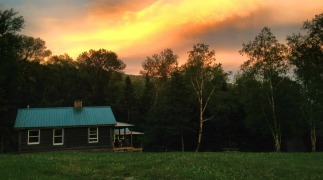 Bulldog Camps, situated on the pond's northern end, offer panoramic view of Enchanted Pond and of the mountains that rise abruptly from its shores. 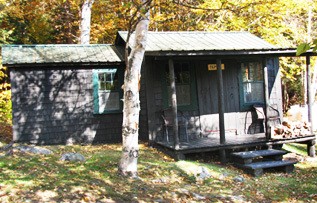 Complete privacy is assured Bulldog's guests, as the camps are the only ones on the lake. 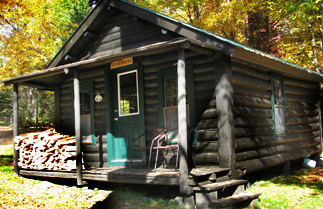 Accommodations consist of 6 authentic log cabins. 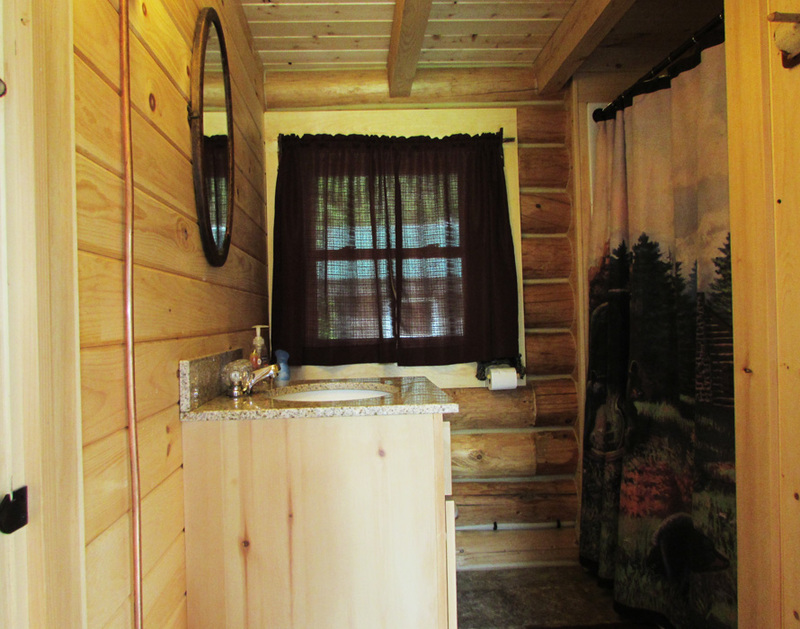 Each cabin has a combination living room/ kitchen, bedrooms, and bathroom with shower. 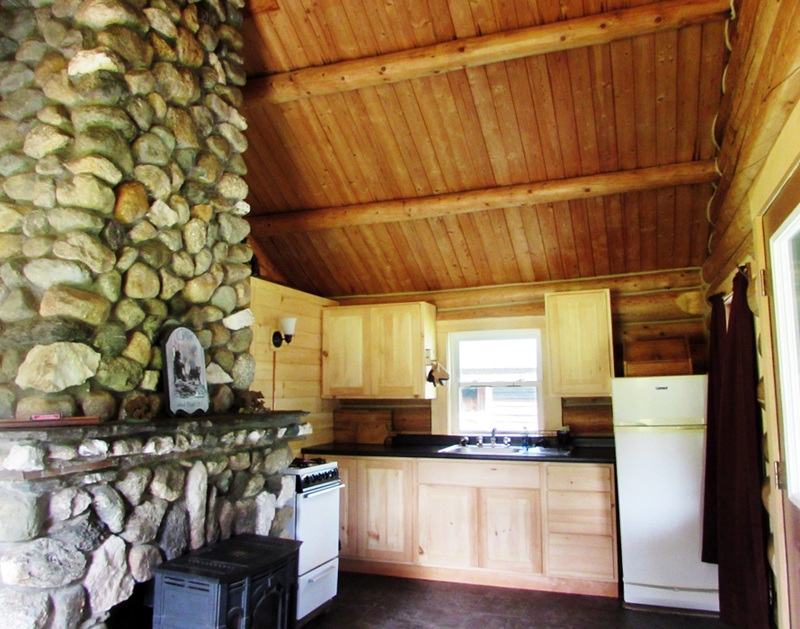 The cabins are equipped with LP gaslights, stoves and refrigerator. Dishes, silverware and cooking utensils are also provided. 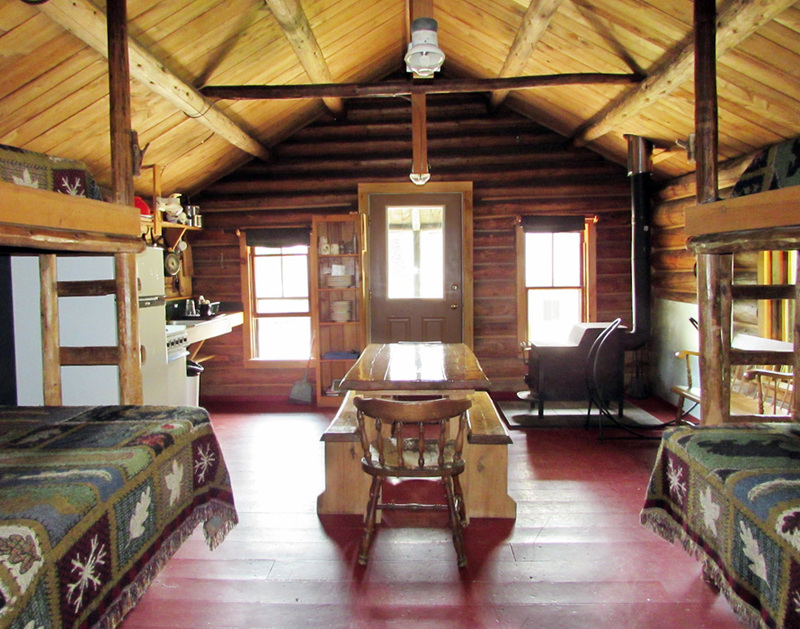 All cabins have wood burning stoves if heat is needed. Please bring your bedding linens, towels, pillow, & personal items. 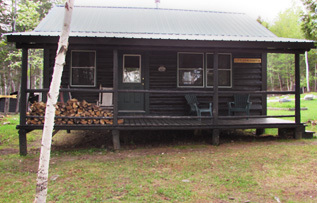 The End cabin was converted into the main lodge after the original lodge burned down in late October 1973. 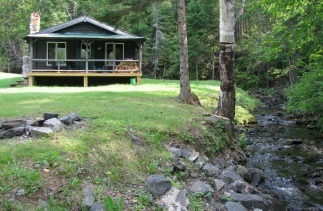 With the new lodge completed, we have converted the old lodge back to a cabin. 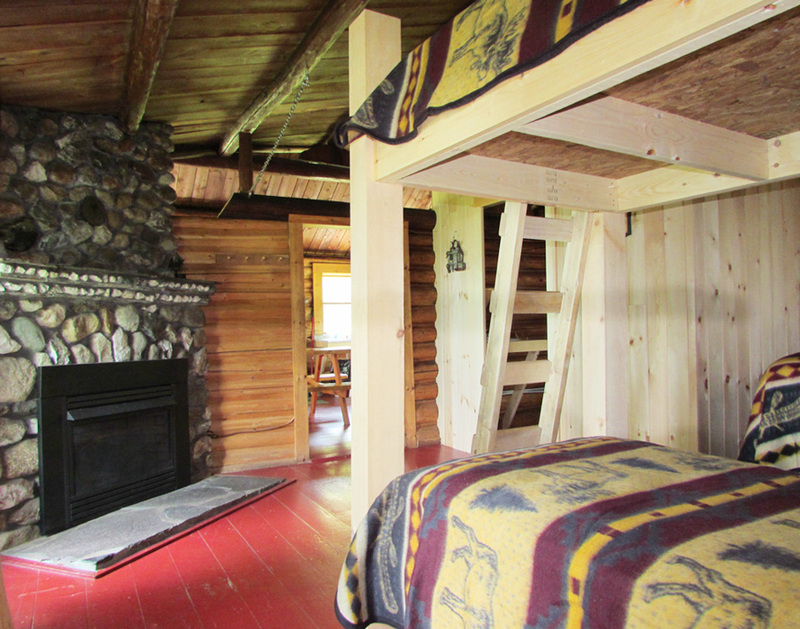 Click here for more info about our new cabin. 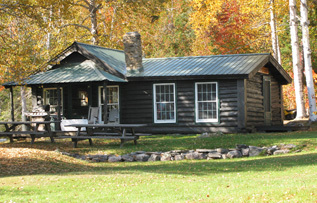 The camps are situated on the north end of Enchanted Pond in Upper Enchanted Township. Activity at Bulldog Camps dates back to the late 1880's. When it was settled as logging camps. The rugged terrain held off the lumberman for many years until the surrounding wilderness had been cutoff. The steep terrain made it very difficult for horses and men alike. Enchanted Pond is the site of the famous log sluice built by Henry P. McKenney. The sluice was 1 1/4 miles long and 30 feet high in places. A dam was constructed at the outlet of the pond to allow for spring log drives. 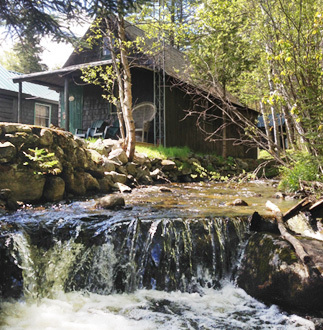 Remnants of the old dam and wooden sluice still remain and the steep mountain rising abruptly from both sides of the pond can allow ones imagination to wander back in time to the hay days of Maine's logging era. The shores of Enchanted Pond are scattered with fossil rocks from millions of years ago making it a popular tradition for rock picking by many guests. The water dives to 202 feet deep at its deepest point with clarity that makes it ideal for swimming, snorkeling, and scuba diving. In the early 1900's more camps were built making Bulldog Camps what it is today. For years fly in float plane service was the primary means of travel to Bulldog and for those looking for a unique experience fly in service is still available. 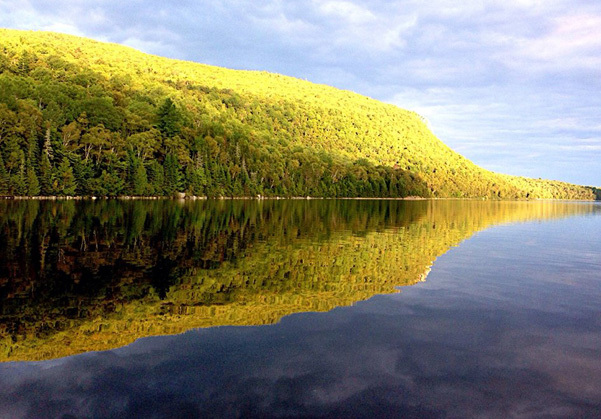 The beauty of the area is enough to impress even the most experienced traveler, with the mountains, lakes, rivers, ponds, caves and abundant wildlife. For those looking to go back in time and leave the hustle and bustle of everyday life behind, Bulldog Camps is your destination.